On February 27, 1941, Franklin Delano Roosevelt gave an introductory address during the radio broadcast of the 13th annual Academy Awards ceremony. His prologue noted the cinema’s ability to show “the truths of our democracy” (1) to a world that seemed badly in need of such a role model. The President’s six-minute address lent Oscar, and by extension Hollywood, just the kind of national credibility it needed at a time when its concerns seemed especially trivial in the shadow of world events. Later that same evening, Preston Sturges cemented his spot as patron saint of writer-directors by accepting the first-ever Academy Award for Best Original Screenplay (2). Nevertheless, he proffered an unusual acceptance, stating “Mr. Sturges isn’t here this evening, but I will be happy to accept the award for him” (3). One can speculate whether Sturges was motivated by modesty, false modesty, or merely the pressure to make a joke (one that he would later characterise as miscalculated) (4). One might as well substitute the word “politician” for “crook”, as in this film its impossible to distinguish between the two. Brian Donlevy, in a rare leading role as Dan McGinty, starts off as a derelict in a soup line and winds up governor of a state solely through his success at shaking people down. Mentored by gangsters known only as The Boss (Akim Tamiroff) and The Politician (William Demarest), McGinty can ensure a steady cash influx from his constituents through brute force or by guile, but always by remaining oblivious to, or at least unintimidated by his own limitations. Even the act that first earns the attention of The Boss, his feat of voting 37 times in a single election, is so brazen that it requires a certain naiveté. The Great McGinty is nevertheless a tale of domesticity as much as of politics. Before reaching the midpoint of the film, McGinty has already grown powerful enough to be favoured by The Boss for the mayor’s own job. But he has to get married immediately, as “women got the vote now… maybe you didn’t hear about it… they don’t like bachelors”. 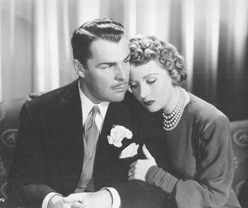 And so McGinty weds his secretary Catherine (Muriel Angelus), setting up a theme Sturges often came back to, the relationship between a man’s career ambition and his romantic life. In scripts as diverse as The Power and the Glory (William K. Howard, 1933), Easy Living (Mitchell Leisen, 1937), and Christmas in July (Preston Sturges, 1940), the love of a woman is what inspires a man to make his mark in the world. In The Great McGinty, as in We Live Again (Rouben Mamoulian, 1934, co-written by Sturges), the woman also acts as a surrogate for his conscience. We Live Again ends with the great romantic sacrifice of the morally-invigorated aristocrat (played by Fredric March) joining the peasant convict (Anna Sten) on her trek into Siberia. Whatever Sturges thought of that ending in 1934, he’d turned it on its head by 1940. McGinty sacrifices for Catherine too, standing up against The Boss and his grand plans for new and improved graft the day after winning the governorship. But he ends up being the one forced out of the country where she cannot follow. Sturges believes that a bum is a bum. Leave the noble gestures to the nobles. It’s a typical Chicago story (6), much of it based on stories Sturges heard there, and though he removed any direct reference to that city from the script, identifiable vestiges of the locale (reference to the lake front, certain street names) remain. Which brings us back, surprisingly enough, to President Roosevelt. The Great McGinty was released in August 1940, just a month after the Democratic Convention at Chicago Stadium where Roosevelt was nominated to run for a record third term. Sturges’ precise views on the President are unclear, but he did include a jab at Roosevelt’s coyness about running in his script for Remember the Night (Mitchell Leisen, 1940); extraneous to that film’s plot, a dress box is wrapped in an old newspaper featuring a picture of F.D.R.’s elder cousin Theodore and the headline “ROOSEVELT REFUSES THIRD TERM” (7). And what is Catherine’s pivotal line in The Great McGinty if not a crude description of the Keynesian philosophy of government expenditure associated with the younger Roosevelt? She explains that it’s impossible to rob the people, “because what you rob you spend, and what you spend goes right back to the people, so where’s the robbery?” Her renunciation of her slogan later in the film signals her turn away from accepting her husband’s greed and selfishness to trying to awaken his capacity for love and humanity. Quoted in Donald Spoto, Madcap: The Life of Preston Sturges, Little, Brown & Co, Boston, 1990, p. 166. From 1935–1939 the Academy gave two writing awards, for Original Story and for Screenplay, each honouring a different phase of a typical studio script’s production. The institution of the Original Screenplay award was in fact a nod toward the independence some writers were increasingly able to get from the studios. Fittingly this first award went to Sturges for the film that marked his unprecedented promotion from writer to writer-director. Quoted in Mason Wiley & Damian Bona, Inside Oscar: The Unofficial History of the Academy Awards, Ballantine, New York, 1996, p. 109. James Curtis, Between Flops: A Biography of Preston Sturges, Harcourt Brace Jovanovich, New York, 1982, p. 135. Sturges wrote The Vagrant with the intention to direct it just after completing work on his first sole screenplay credit, The Power and the Glory, but no studio was willing to give the writer that much power until 1939 when Paramount bought the script, Down Went McGinty, for ten dollars. Brian Henderson presents this quote from the “refinished” September 1, 1933 draft in his introductory notes for Five Screenplays by Preston Sturges, University of California Press, Berkeley, 1985, p. 44. There’s a line in at least one draft of the script that states, “The locale is the mythical city of Chicago in the imaginary state of Illinois”, which seems suspiciously similar to the opening of The Front Page (Milestone, 1931): James Harvey, Romantic Comedy in Hollywood, From Lubitsch to Sturges, Alfred A. Knopf, New York, 1987, p. 547. Anyone who has seen The Palm Beach Story (Preston Sturges, 1942) remembers a similar but much more hilarious jab at the President uttered by Mary Astor.